Namine has been practicing climbing into the bathtub. It has presented some new challenges, but nothing that a little creativity and determination can’t handle. As Namine has gotten it into her head to become as independent as possible (and more power to her, we say), she’s become interested in climbing into the bathtub. So Namine and I have been working on her technique, if you will, for climbing into the tub. 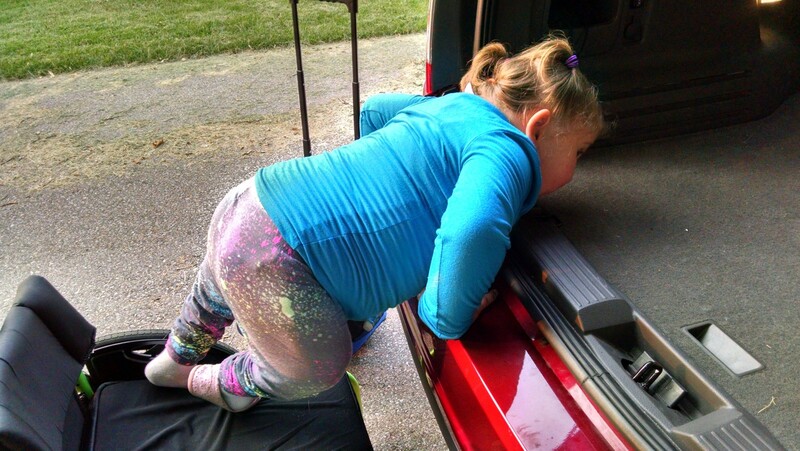 The initial way that she’s tried climbing in — by turning her body and lifting her legs — does not work, will not work, if her left knee does not bend. You can see in the video below that she needs someone to lift that leg over for her. Namine’s left leg — to be specific, the knee that won’t bend — is the source of her frustration lately. 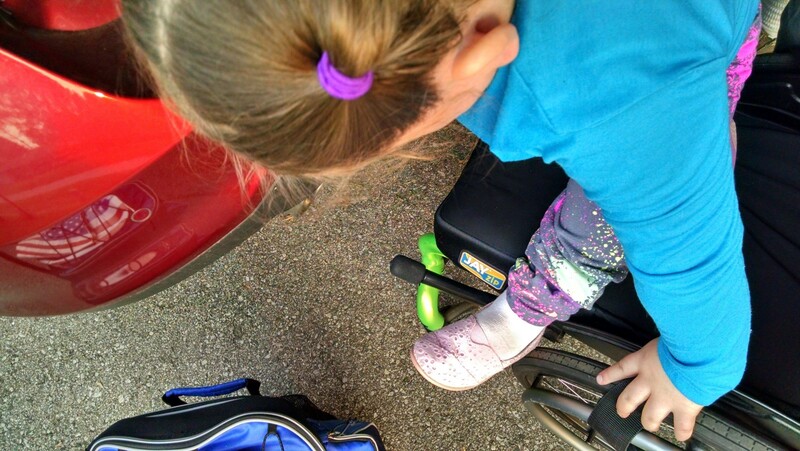 She’s taken to calling it her “broken knee,” not because it’s broken as we would normally understand it, but rather because it doesn’t work as a knee ought. Knees bend. Namine’s left knee does not. The picture above isn’t the greatest, but it does show how Namine’s leg has to be positioned for her to stand up. She has to rotate herself sideways to allow for the leg to be maneuvered. Think of it like walking up stairs with one leg always extended, never allowed to bend. You’d have to rotate your body to get your leg up each step; that’s precisely what Namine has to do in standing up to do anything: climb into her wheelchair, stand up in her walker, climb up on the toilet, climb into the bathtub. It’s for this reason that Namine — not Jessica or myself — has taken an interest in setting up an appointment with Dr. Black, her orthopedic surgeon. Namine knows that to release that knee means surgery. But after questioning her repeatedly on the topic, she remains adamant that she wants her knee to work correctly. But all of Namine’s frustrations in standing up to perform various tasks do not impede her progress. No, she finds a way to make it work. Sometimes it takes her a little while to work out the physics, but she gets there. She enables herself. In the case of climbing into the bathtub, Namine figured that she’d never be able to get in by herself if she continued in the way I’d originally directed. Instead of relying on her legs, she simply walked herself in on her hands, pulling herself forward. She did what she’s always done: figured out her own way, using her strengths (in this case, her arms) to her advantage. Good job Namine!! I’m proud of your hard work and of you thinking through the problem and figuring out a way! !